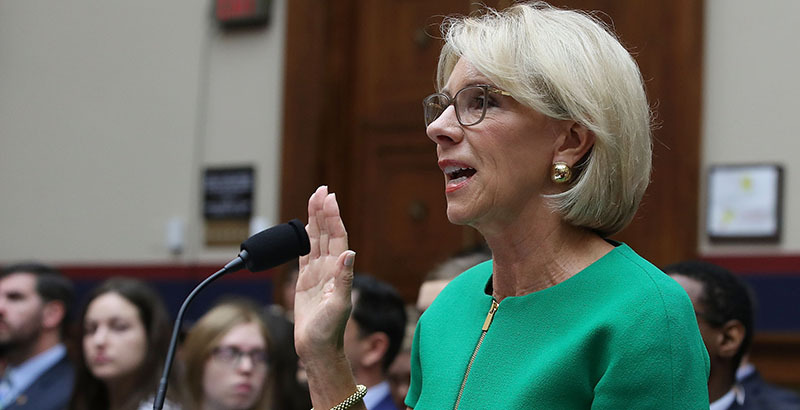 Members of the House Education and the Workforce Committee of both parties raised a host of issues, covering K-12 through higher education, on Tuesday at their first hearing with Education Secretary Betsy DeVos since her February 2017 confirmation. Though DeVos has testified before Appropriations committees in both the House and the Senate and, of course, made a memorable appearance at the Senate Health, Education, Labor and Pensions Committee during her contentious confirmation process, she had yet to appear before either of the education-policy-writing committees during her time as secretary. DeVos, a billionaire school choice advocate who formerly led the Michigan GOP party, appeared more at ease and better prepared at yesterday’s hearing than she has in past congressional appearances where she’s made gaffes or seemed uninformed. That said, her answers were more vague than specific about how the U.S. Education Department plans to address several critical issues. Here’s some of what DeVos discussed with the Education and the Workforce Committee during the nearly four-hour session. 1. School safety: DeVos is the chair of a federal school safety commission, started in the wake of the February 14 mass school shooting in Parkland, Florida. The commission has been criticized for only including Cabinet secretaries among its members and meeting largely behind closed doors. DeVos last week met with survivors of mass shootings; the Education Department released video of the closed meeting Monday. Members are seeking input from parents, students, educators, law enforcement, and others, and should have recommendations, which highlight little-known policies successfully being used around the country, “by year’s end,” DeVos said. 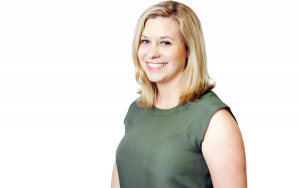 She said later that the committee hopes to produce an “interim report” and that she would “consider” testifying before the Education and Workforce Committee again, specifically on school safety. 2. Teacher walkouts: In the past two months, teachers in West Virginia, Oklahoma, Kentucky, Arizona, Colorado, and North Carolina have gone on strike and staged protests at state capitols, arguing for better pay, increased education funding, and other education policy changes. 3. Military education savings accounts: Members of both parties asked DeVos about a proposal to provide education savings accounts to children of some members of the military, paid for with Impact Aid, a $1.4 billion federal grant program that supports the education of federally connected children. It’s currently pending as a proposed amendment to the annual defense policy bill and, if passed, would provide either $4,500 or $2,500 for families to use on private school tuition, tutoring, or other educational expenses. The response by DeVos, whose administration has made school choice its No. 1 issue, was clear: She backs the policy in general, but not how sponsor Rep. Jim Banks, newly a member of the Education Committee, proposes to pay for it. “I support the concept of giving military families more options and choices, but the vehicle of using an Impact Aid funding stream is not one that I support and that the administration supports,” DeVos said. 4. Title IX sexual assault rules: DeVos last fall overturned Obama-era rules that set new standards for schools’ adjudication of allegations of campus sexual assault and harassment, arguing they were written without public input and tilted the balance too far in favor of accusers. “Adjudication process at schools must be fair and impartial,” she said. 5. Immigration enforcement: New York Democratic Rep. Adriano Espaillat, the first formerly undocumented immigrant in Congress, questioned DeVos on the appropriate relationship between school officials and federal immigration enforcement. The U.S. is “a nation of laws” but Americans are “a compassionate people,” she said, adding that if there are deficiencies in immigration laws, Congress should address them. A long-standing Supreme Court decision requires K-12 schools to educate all students, regardless of immigration status, she said, but it’s a local decision as to whether school officials should notify Immigration and Customs Enforcement agents when they become aware that students or their families are in the country illegally. “These issues are state and local issues to be addressed and dealt with,” DeVos said. Espaillat argued that immigration is a federal issue and that DeVos, as head of the Education Department, should set the policy. 6. Discipline guidance: Republican Rep. Jason Lewis asked DeVos about an Obama-era guidance document that urged districts to limit suspensions and expulsions, and reminded school leaders that discipline outcomes based on race could be a violation of federal law. In the 2015–16 school year, black students were 15 percent of K-12 students, but 31 percent of those who were referred to law enforcement, according to the latest Civil Rights Data Collection. Black students were also disproportionately likely to be suspended or expelled, even in years after the Obama-era guidance was in effect. Republicans have said the guidance was an inappropriate intrusion into local decisions and could make schools less safe as officials are forced to keep disruptive students in class. There is “a lot of intensity on both sides of the issue,” DeVos said, without tipping her hand on whether the department might change course. “We need to ensure that students are treated justly and fairly, and it is not tolerable if a student of one color is disciplined more harshly than a student of another color for the same infraction. We know the data also shows disparities, but the broader issue is the question of what is ultimately right for each and every individual student in protecting their rights,” she said. Rep. Bobby Scott, the ranking Democrat, in his closing remarks argued that the Obama-era guidance imposed no new regulations on schools, and that existing federal civil rights law already prohibits disparate discipline based on race. 7. Transgender students’ rights: Rep. Jared Polis, Democrat of Colorado, asked about the department’s recession of guidance documents that required schools to allow transgender students to use restrooms and locker rooms matching their gender identity. Two federal courts have ruled that gender identity should be a protected class under federal law, he said, pressing DeVos to commit to enforcing civil rights protections for LGBT students. DeVos pointed out that other courts have decided federal law doesn’t protect gender identity. Until Congress passes a new law or the Supreme Court makes a final ruling, “I am not going to make up law from the Department of Education,” she said. It was the clearest answer she has given yet on federal civil rights protections for LGBT students, an issue that Democrats have hammered in previous hearings with DeVos. 8. Approval of state ESSA plans: Scott, at the start of the hearing, asked why DeVos was approving state plans under the Every Student Succeeds Act that he says don’t incorporate the performance of traditionally underserved subgroups of students, such as low-income students and children with disabilities. The law requires states to work to close achievement gaps and to include subgroup performance in school rankings, he said. DeVos said she hadn’t approved plans that don’t follow the law, and that Scott’s concerns confuse summative ratings, such as A–F grades, which aren’t required under the law but which some states are using, and the incorporation of subgroup performance. Scott in his closing remarks called out several points in the law that require states to include subgroup performance in school measures, even if they don’t use a summative rating. 9. Career and technical education reauthorization: Several Republican members raised a bipartisan reauthorization of the Perkins Act, which governs federal grants for career and technical education. The bill passed the House by a wide margin in May 2017 but hasn’t moved in the Senate. A reauthorization is important to offer forward-looking, flexible programs for students and industry, DeVos said, adding that she would “encourage and urge” the Senate to move on the bill. Elsewhere at the Capitol Tuesday, House and Senate Democrats unveiled their plan to improve K-12 education. It includes $50 billion for teacher raises, $50 billion for school infrastructure improvement, protections for teachers to collectively bargain, and an increase in funding for special education.